The Greenlands Securement Strategy is a science-driven, criteria-based process that identifies significantly important conservation land. 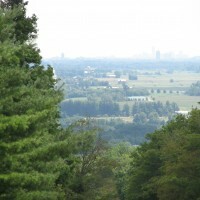 The CVC Greenlands Securement Strategy recommends at a minimum, over the next 20 years, that 5,670 hectares of greenlands within the Credit River Watershed be secured by CVC and its partners, as these lands will contribute to the foundation of a connected system that will provide natural heritage protection, appreciation and recreational benefits for healthy ecosystems and healthy communities. This document is designed to complement regulatory and voluntary programs of CVC, and provide practical implementation of regional government and area municipal greenlands securement policies.